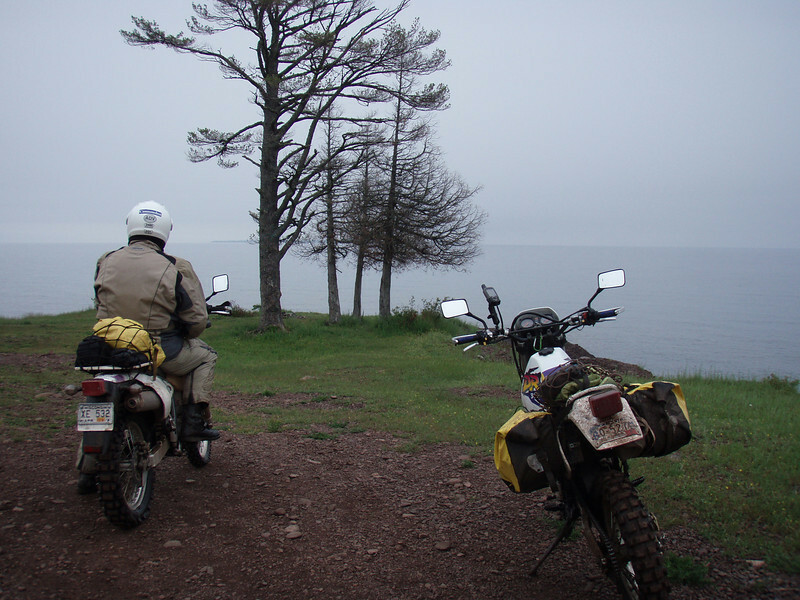 Discussion in 'Ride Reports - Day Trippin'' started by nordwulf, Jun 1, 2010. The Keweenaw Peninsula in Michigan is the little finger that extends all the way into Lake Superior. US-41 ends a few miles east of Copper Harbor where the road turns into gravel, sand and rocks. And that&#8217;s where the fun starts when you enjoy remote and end-of-the-road type places. I always looked at this place on maps and just had to find out more and explore these logging roads and other dirt tracks. Thanks for the report! I think I'm going to ride out there soon. The U.P. is a amazing place. Lots of exploring opportunities. That place is amazing any time of the year. Great Adventure. The lake is Schlatter Lake and is difficult to get to with ordinary vehicles. The silence with only sounds of nature made it so peaceful. Some eagles floating above the lake made it complete. There's some great riding in the U.P. I've only been there once..
We made it out to the same spot a week and a half ago. There had been a lot of rain, so the ride out to the tip was through a lot of water. http://www.societystjohn.com/store/ If ya need to pick up something for the Missus... nice fruit preserves (and baked goods for you!). http://www.thegaybar.com/ It might not be what you expect, but they do sell a lot of t-shirts! Looks cool. Definitely an option for people going to CADVR. thanks wulf for a nice report. i grew up around there - so many roads to play on and each an adventure. good times and your pics brought back some fond memories. i really need to get back there on the gs. if any of you live in the wisconsin, minnesota, or even illinois area, the UP is a great fairly short excursion with a lot of fun roads and people. i'm always surprised that so many don't know about this gem. Sweet ride, Dig the wee in orange. I believe that's the fast color? Cool Report, got to love those orange Wee's. Thanks for sharing with us. I almost feel guilty not exploring more of the state that I live. I need to get up there next year and ride some of those dirt roads. Nice RR. Hope to get to the UP next summer and your report and pics add some more ideas for exploring. Thanks. Nordwolf - I know this is a very old thread...dont know if you are even active on ADV anymore...but a quick question... Once you leave the end of US 41 heading towards the rocket range - is it passable by a 4 wheel drive truck, towing a small enclosed trailer? Im thinking it might be a good spot to set up for a couple of nights so my wife and I can ride out of that area a bit.